An annual, permanent record for your medical file that gives Dr. Swikard comparisons for tracking and diagnosing potential eye disease. 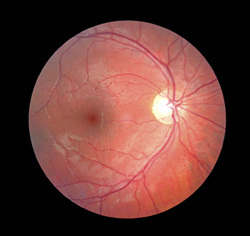 The ability for you to review your retinal image with Dr. Swikard during your exam. Photo documentation is fast and easy. Nothing will touch your eye and usually eliminates the discomfort associated with pupil dilation. It is important to note that dilation may be necessary should abnormalities be detected, or if an acceptable picture is not obtained. Dr. Swikard highly recommends the retinal imaging exam annually for ALL patients.